There's no denying we're product junkies, but when it comes to acne, we'd rather apply more of a holistic approach than hoard spot treatments and cleansers. Especially for those of us who fall victim to the drying and burning side effects of pimple potions, addressing the situation internally makes for less stress on the skin (and in general). So when we recently learned that spearmint tea is acne's foe (more on that to come), we decided to research some other ways to sip our way to a clearer complexion, sans skincare products. 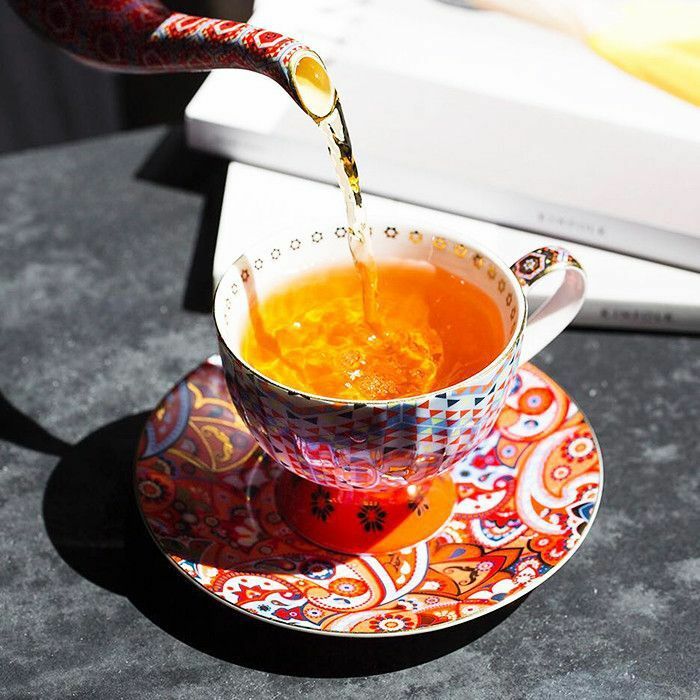 Truth be told, there's lots of tea ahead (tea is the Magic Eraser of pimples), but we've included a few other tasty libations to quench your thirst… for a smoother complexion, that is. Take a look at the best anti-blemish beverages below! Along with a bevy of other incredible health benefits, this trendy drink is chock-full of antioxidants, or EGCGS, to help counteract the sebum oxidation that occurs pre-acne formation. Ingesting antioxidants also helps to reduce signs of inflammation from the inside out, and, given that matcha has 137 times more antioxidants than plain-old green tea, you can rest assured you're getting a hefty dose with each drink. Curcumin, a component of the spice turmeric, is widely known for its anti-inflammatory, antiviral, antioxidant, and antifungal properties. In Ayurveda, it's used for medicinal purposes to heal a wide range of internal and external maladies and conditions. While today, turmeric is a popular ingredient to concoct a DIY mask with at home, you can also add one teaspoon to hot water to drink as tea for similar acne-healing benefits. In one study, participants who drank fermented milk with 200 milligrams of lactoferrin daily (like that found in kefir) saw an almost 39% decrease in inflammatory acne lesions over a 12-week period. The gut is greatly connected to your skin health, which is why ingesting probiotics like lactoferrin are great for counteracting bad bacteria and reducing inflammation. After meeting with Dr. Carl Thornfeldt, founder of Epionce Skincare, we learned that drinking two cups of organic spearmint tea daily reduces inflammatory acne lesions by 25% after one month and by 51% after three months—which is even more effective than prescription remedies. Amazing, right? This editor tried it herself and was met with impressive results (read: bright skin, far fewer breakouts, and reduced redness). Before rolling your eyes at this one, know that while it's tattooed into our brains that drinking a fair amount of water every day is important for our overall health and well-being, pay attention to its temperature. Warm water is much more beneficial: It helps detoxify the skin and regulate digestion (remember the connection between your gut and your skin?) whereas cold water can actually harden the oil in consumed foods and create fat deposits in the intestine, and adding ice to water actually strips it of its essential minerals which are important for digestive health. Also, when you drink cold water, your body focuses its energy on regulating your body's temperature instead of digesting food and absorbing nutrients, which could lead to water loss (and hydration is essential for good skin health). Drink a cup in the morning to kick-start the detoxifying process. Don't reach for the cherry juice cocktail loaded with sugar from the grocery store—in order to get the best skin benefits of this beverage, sip on the real thing. While tart cherry juice is, well, tart, it may be tough on the palette, but it's packed with antioxidants, vitamin A, B, C, and D, and helps balance your skin's pH. It's also an anti-inflammatory, and—if you weren't sold yet—it even has melatonin, which will help you sleep better. Is this a miracle drink, or what? Have you had acne-healing success with any of these drinks? Please tell us your experience below!